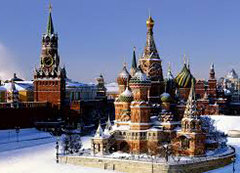 Russia is an incredibly vast country; the largest in the world in terms of land mass. It stretches from the reaches of Europe in the west, over the south central Altai Mountains , ending nearly at the United States’ tip at the edge of Alaska just east of the Kamchatka peninsula. Across this great expanse of land can be found thousands of years of history and culture in one of the most diverse landscapes in the entire world. There are many famous landmarks in Russia for guests to visit and enjoy; but, in such a big country, it’s impossible to see everything in one or even in multiple trips. Past guests have their favorite Russia landmarks that they rave about which can give new travelers to the area a good starting point on what to see when they arrive, and we’ve compiled the best ten of them to help get new guests started. 1. Moscow Kremlin: Moscow is the starting point for a great majority of Russian adventures, and most guests take the opportunity to check out the Kremlin found here. Not a single structure, rather a mythical city unto itself – this self contained city houses armories, churches, palaces and a fortress that signify the remnants of an era long ago. The arsenal, palace and senate are all popular Russia landmarks for guests to visit and the Tsar Cannon and bell, oddities because they have never actually worked, are also popular stops. One of the tallest structures in the country is also found here, the Ivan the Great Bell Tower, which boasts a gleaming dome. 2. St. Basil’s Cathedral: Perhaps one of the most very well known of all Russia landmarks is the uniquely hued and daringly designed cathedral at St. Basils, located in the iconic Red Square. Ivan the Terrible was responsible for the building’s construction, following the capture of Kazan in the 1500s. It was a couple of years following this victory that the still standing cathedral was completed, and little else in known about the building or its design, although it’s remained the center of much speculation and local legend. 3. Moscow Bolshoi Theatre: Commissioned by Catherine the II, the Bolshoi Theatre is home to regular performances of both opera and ballet. Although the building has undergone extensive restoration which has netted in a loss of some of its original historical significance from the 1700s during which it was built, these renovations have given it a unique distinction as it’s one of the most technologically advanced theaters in the world. It remains one of the most popular Russia landmarks for visiting tourists who can both take twice weekly tours or catch a show at the symbolic theater. 4. Hermitage St. Petersburg: In St. Petersburg, the Northern capital of Russia, visitors will find one of the largest displays of art, sculpture and historical artifacts in the entire world. Here, nearly three million different pieces are on display for guests to enjoy, however the site itself is something to behold as well. The museum is comprised of various important Russia landmarks including the Winter Palace and Hermitage Theater, making for a unique look at history both inside and outside, fully encompassing the entire grounds. 5. Catherine Palace: When Catherine I wished for a summer palace to enjoy, she commissioned this stunning representation of Rococo architecture. The structure has undergone many changes since its original 1717 construction, including the replacement of glistening gold exterior accents by drab, olive tones by Catherine II. It’s one of the most popular St. Petersburg Russia attractions because it’s an incredibly impressive building. In fact, it was designed to be just that to amaze visiting ambassadors and courtiers. While the outside of this stand out amongst Russia landmarks is awe inspiring to say the least, the interior fails not to shock and amaze as well, especially the ballroom which is outfitted extensively in gold detail. 6. Peterhof Fountains: Regularly referred to as “The Russian Versailles, “the fountains at Peterhof are more than a simple water feature. On these grounds can be found multiple palaces and gardens, but the Grand Peterhof Castle and Grand Cascade are amongst the most stunning. The entire complex is a designated World Heritage site and one of the most famous Russia landmarks. 7. Golden Ring Russia: Although it may be difficult to think of a baker’s dozen worth of small cities as a selection amongst Russia landmarks, the thirteen (originally eight) that comprise the Golden Ring are incredibly important to the country’s history and the formation of the Russian Orthodox Church. Monuments, monasteries, Kremlins, churches and cathedrals that preserve the history of Russia can be found here, in an area that has been described as an open air museum. Some of the most beautiful countryside in the nation can be found here, as well as an exciting array of the onion domes that the country is known for. 8. Novgorod Kremlin: Markedly different from the Kremlin found in Moscow, the once Pagan burial ground turned fortress found at Novgorod draws thousands of visitors every year. A cathedral can be found on the grounds as well as a monument, and visitors enjoy climbing one of the structure’s many towers that is open to guests. A museum, many small churches and a park are found here as well. Like many Russia Landmarks, the compound has undergone many changes in its centuries’ old history, and many buildings that are no longer present at Novgorod are referenced in literature, indicating that the Kremlin once housed a great many additional structures. 9. Lake Baikal: Anyone interested in prehistory will not want to miss out on a chance to visit this southern Siberian lake, the oldest in all the world. Aside from its age (thought to be over twenty five million years old) it’s also the deepest lake in the world, reaching more than seventeen hundred meters deep in some parts. Nearly one fifth of the world’s unfrozen freshwater can be found here, along with a stunning diversity of wildlife, thought to be one of the best examples of the planet’s evolutionary history. All of this along with the picturesque setting of this natural wonder makes it a destination worth getting to for visitors to Russia. 10. Sochi Olympic VIllage: Even prior to the 2014 Olympic Winter Games, Sochi was a major Russian resort found at the Black Sea coast boasting a subtropical climate with hot summers and balmy winters. In addition, this unique Russian resort features sunny beaches in close proximity to snow caped mountains, perfect for skiing. 2014 Olympic Games placed Sochi on the travel map of many tourists seeking to discover this unique Olympic Village that was hosted in a beautiful geographical setting. Visitors can discover not one but three Olympic Villages, namely Coastal, Mountain and Endurance. The city of Sochi itself offers plenty of Russia landmarks not to miss including Sochi Zoo, Aquarium, Sochi National Park, Dendarium Botanical Gardens, coastal boat trips and so much more.